The Month in Theydon (October): Trevor Roberts latest report is on line Click Here. Parish Council Minutes: The minutes for the meeting of the 28th September 2006 are now available. Click Here. 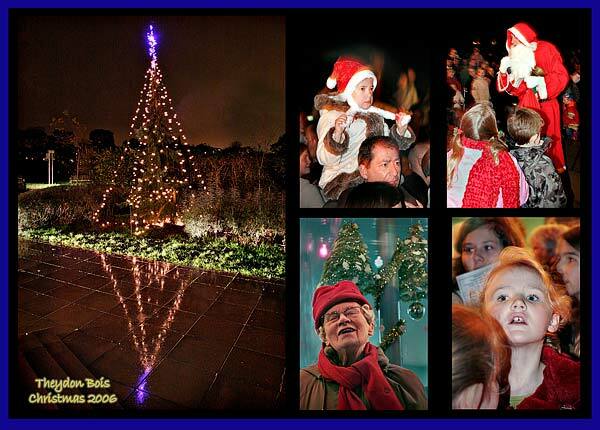 December 2006 Village News: The latest PDF version of Issue 56 of Village News is now available on line. Click Here. 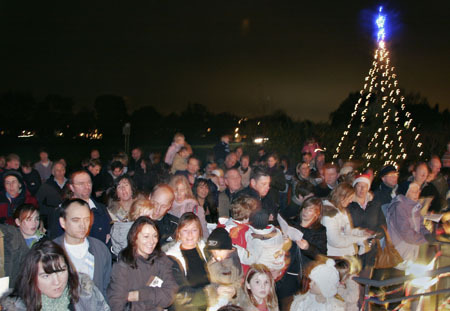 Father Christmas arrived in Theydon Bois last Friday at the ceremony to turn on the Christmas tree lights. The current Villagers of the Year, Mr Tony Ames and Mr Trevor Roberts, turned on the lights and villagers joined members of the Parish Council to sing carols around the tree. Members of Theydon Bois Singers led the carol singing and the choir from Theydon Bois Primary School entertained the crowd by performing Christmas songs. After the ceremony, which was also attended by Rev Canon Colin Travers and David Penegar from the local churches, residents went into the Village Hall for mulled wine and mince pies while Father Christmas distributed sweets to the children. During the evening a collection was made in support of St Clare Hospice raising £452.18 for the charity. We have a Flash Slide Show with more pictures here. Opening Hours 9-1pm Weekdays 10.30-2pm weekends. Cat of the Month! Handsome Ringo! (he has a ring of white fur on the tip of his tail) Gorgeous fellow desperate for a loving new home to remind him he is just as loved now as when he was a kitten. Loves to be tickled on his ears and under his chin. Looking for his turn for some tender loving care is that you? Come and see him or see some of our other cats looking for good homes on our Chestnut Cat Sanctuary Web Site. Open 7 days a week 363 days a year! Urgent Neighbourhood Watch Item: With Christmas fast approaching,most people would not give a second thought to returning home from work to find a card posted through their letterbox from a company called PDS (Parcel Delivery Service ) suggesting that they were unable to to deliver a parcel and requesting that you telephone 0906 6611911 to re-arrange delivery. Theydon Bus Route Threat: Arriva are treatening to withdraw the 500 Bus later in the New Year because they are saying that there are insufficient passengers. Especially when it’s market day. More Neighbourhood Watch Information: Theydon Bois now has its own designated Community Support Officer, her name is Lorraine Oxley and you will see her walking around the Village. If you need to contact her about any local matter , her phone number is 07779-317211, if she is not available at the time that you call you can leave a message for her on that number, or contact Epping Police Station on 01992-561212. One of the benefits of belonging to Neighbourhood Watch is that you will become familiar with Crime Prevention ideas which will keep your home and belongings safe. To this end ,I have several Home Office leaflets to help with, amongst other things,: Home Security, Peace of mind while you are away, and How to Deal with Bogus Callers etc. If you would like copies , please ring me on the number below. The Village now has 36 Road Co-Ordinators, and I would like to thank them all for their support and help in the last few months. More Co-Ordinators are always welcome --if you feel that you would like to volunteer do please ring me..
Now a word of warning for all computer users,.in the last 2 --3 weeks, I have received several E--Mails purporting to be from Barclays Bank, asking me to forward my personal details to them,although I do not bank with them. I took a copy of the E--Mails into Barclays in Epping , who are going to forward them to their Fraud Department.Please remember that Banks will never ever ask you to forward your personal details on line or by telephone, to them, so ignore all requests to do so, or do as I did and take copies into the relevant Bank. Lastly ,my Husband and I would like to wish you all , a Happy, Healthy and safe Christmas. I will be running a surgery at Theydon Bois Village Hall every 2nd Wednesday of each month, starting from 10th January 2007 between the hours of 10am to 12 Noon. If you have anything to discuss or you would just like to pop along for a chat it would nice to meet you. Drama Society New Production: Theydon Bois Drama Society's next drama show will be 'Season's Greetings' - a comedy by Alan Ayckbourne. Dates are Thurs 11th - Sat 13th January 2007, at Theydon Bois Village Hall, Coppice Row, Theydon Bois. "Relatives and friends meet up to celebrate Christmas. Petty and not so petty squabbles break out with hilarious consequences, though some are disastrous!." A New Wood for Theydon Bois: Information about this was first given on the Web Site and in March issue of Village News but not everybody seems to have read it! Since then, following the general distribution in the village of leaflets from the Woodland Trust, we have had yet more enquiries! For those who are still not sure just where the new wood is, it stretches from the Theydon Bois cemetery on the Abridge road southwestwards towards Debden and lies between the M11 motorway and the Central Line railway. It covers about 60 hectares, or 100 acres, and the Woodland Trust is hoping to raise money from local people to help with the cost of trees. Planting will be done with the aid of volunteers and the Woodland Trust is planning to enlist the help of local schoolchildren. The Theydon Bois & District Rural Preservation Society is strongly in favour of this new wood and has given it financial support and urges anyone else who can to do the same. VILLAGE IMPROVEMENTS : We continue to work with Essex CC Highways Area West to deliver Highway improvements to the Village. Some of these are now being actioned following discussions earlier in the year. Perhaps we should have had photos taken standing next to them but actually getting the jobs done seemed more important. The re-furbishment of Theydon Road, Piercing Hill, The Green, Loughton Lane & Debden Lane. Preliminary works have already started on the road surface and some stretches of pavements, along with new sections of kerbs and paving in Debden Lane. Pavements and roads are due to be started in the coming month. New grating in Coppice Row opposite Birch Hall. Where the road had sunk close to the junction of Elizabeth Drive and Forest Drive this has now been repaired The piece of road which has also sunk outside The Queen Victoria in Coppice Row is due to be repaired along with the displaced kerbs at the junction of Woodland Way & Baldocks Road. Negotiations with Highways are continuing about the positioning of an illuminating “Slow Down” sign at the junction of Piercing Hill & Morgan Crescent. This is not, as erroneously reported, at the Bell Common end of the road. After negotiations, Highways have now been replacing whole stretches of kerbs with new ten inch concrete kerbs which are haunched in to prevent heavy vehicles constantly displacing them. As a result they have renewed two radius in Hornbeam Road as well as the previously mentioned junction on Purlieu Way with Baldocks Road . The junction with Purlieu Way and Harewood Hill has been agreed. New railings in Coppice Row, next to the Zebra crossing, have been agreed. 141m of kerb has been completely renewed in Orchard Drive, along with new railings, outside the Primary School. We are very pleased with the standard of the Contractor’s workmanship, (May Gurney), and the benefits of the newly negotiated contract are now coming through. Our wooden bus shelter, opposite Tesco, has been repaired and re-furbished with the kind assistance of Matthew Cable. A preliminary date of 21/01/07 has been made for the closure of Poplar Row where it has been agreed the length of road is to be completely re-planed, after exploratory works have taken place to ensure the sluice under the road is functioning. We are also pleased that an oak tree and a Hornbeam tree in the Highways verge in Loughton Lane have been reduced, with the kind assistance of G. Hayley and C. Neilan of EFDC, but were rather concerned at Essex CC decision to fell a healthy Ash and Hawthorn further along the Lane which went against EFDC’s recommendation. The City of London have cut back the hedge line between the “Flower Yard” and the Avenue of trees as well as cleaning out the ditch alongside “The Plain”. We would like to thank Sean, ( our Village “sweeper”), Dave Butcher, and the rest of the Corey Waste Management team for their assistance in the up-keep of the village. We would also like to take this opportunity to thank Metronet, who are presently re-furbishing Theydon Station. They have reinstated the flower beds on both platforms and donated money for daffodils and tulips to be planted. This planting has been carried out by Cllrs Hannibal & Purkiss. The Highways and Environment Committee are pleased to work to achieve improvements to our Village but point out it is for everybody’s benefit, and not for any particular political grouping. Blunts Farm Planning Application: The planning application below appears in the EFDC list for 17th November 2006. Applicant:	Blunts Farm Estates Ltd.
Proposal:	Completion of 18 hole golf course, practice ground and academy with varied landscaping/contouring from permission granted on 23/04/02 (EPF/765/99) including water features and creation of planted buffer zone to eastern boundaries and access to Abridge Road. Erection of a golf club house, groundsmen’s equipment store and fertilizer/chemical store with associated car parking. Please note this very important application above, which has implications for our entire village. At present Enforcement Notices still apply to this site preventing any more vehicle movements, but approval of this application in its present form would allow over 16,000 more heavy vehicle deliveries (over 32,000 return journeys) and the Golf Course and Club House layout in the proposals would almost certainly have more impact on the Green Belt than the previously approved applications. It is important that as many Theydon Residents as possible make their views on this application known to EFDC as we could see a resumption of 100’s of heavy vehicle movements each day. There is a meeting scheduled between planning officers of EFDC, Theydon Bois Parish Council, Lambourne Parish Council and Theydon Bois & District Rural Preservation Society this week followed by the Parish Council Open Meeting at 8pm Thursday 30th November when we hope to learn more about the implications of this application. TBAAG have also been making enquiries about this latest application and members of the public can view the plans at the Civic Offices in Epping, although to fully understand the implications it is necessary to take into account all the previous applications. We will try to add more information here soon. Although the indicated closing date for objections is normally 11th December EFDC has told us that they will consider representations after this date up till the application goes before committee. It is possible to view the application at the EFDC web site HERE and note your objections HERE . 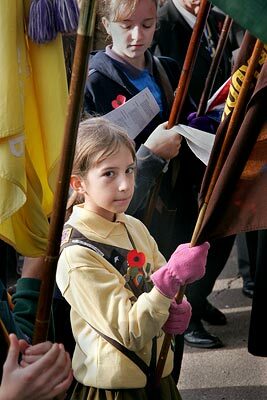 Pictures from Sunday 12th November when many Theydon Villagers of all ages turned out to take part in the Annual British Legion Service of Remembrance at the War Memorial and St. Mary's Church. assist members of the forces and their families is known throughout the world. Council, St Mary’s Parish Church and most of the organisations in the Village. and we all stood in respect to those who had fallen. the congregation who came out of the church into bright sunshine on this very special day. this year was £3,652.05. Thank you to all who contributed especially the collectors. Peace to all. Wilfred S Shales. organised by Theydon Bois & Abridge Action Group (TBAAG). TBAAG have now submitted a detailed written response to the Planning Inspectorate, however we propose to make further verbal representations concerning the situation, at the Public Enquiry, currently scheduled for 9th January 2007. Copies of the e-mails to the e-petition address (which represented over 700 people) have been sent along with our 85 page response to the Planning Inspectorate. A copy of the response, minus photographs, can be found here or see below. We would also be keen to hear from residents their own estimation of the number of HGV trips they think travelled to the Blunts Farm site over a specific time period. EFDC estimate that the total spoil imported would equate to approximately 60 trips per day, one HGV every 10 minutes, over 2 1/2 years. However personal estimates from individual residents and road users would go a long way towards demonstrating the actual level of truck movements that residents experienced. We need the planning inspector to understand the effect these truck movements had on the daily lives of residents. We thank you all for your cooperation. Your continued support would be very much appreciated. The Theydon Bois and Abridge Action Group. More on Blunts Farm Appeal: Our Parish Council together with the Theydon Bois & District Rural Preservation Society and Lambourne Parish Council are also still hard at work responding to the new appeal notices that have been issued regarding the changed wording of the enforcement notice at Blunts Farm and are also preparing for the Public Enquiry mentioned above. The Parish Councils response to the original appeal notices is also available below and the Preservation Society's response (minus photographs) is available as a Word document here with the Appendix here. Rail & Road in Theydon: When Theydon Bois Rural Preservation Society held their October talk on the "History of the Central Line" by Mike Ashworth the Oak Room (Main Hall) in the Village Hall was packed out and it was standing room only. So those who attended (and others) will probably be interested in the excellent article on 'Rail & Road in Theydon' by Ian Strugnell that appears in the Loughton and District Historical Society's latest Newsletter No. 170 September - October. The newsletter is available as a free pdf download from the Newsletters Page of the Society's Web Site. Threat to Avenue of Trees: The City of London Corporation has recently had an independent survey carried out on the avenue of oak trees. The survey has recommended the felling of ten of these because of decay or potential instability. There are at present 59 growing oaks in the Avenue and the removal of ten trees would have a significant effect on the most important visual aspect of our village, the one that contributes to our unique character. The Parish Council are most concerned about the potential number of oaks to be felled and have asked that a "Picus" decay and deterioration survey is carried out before any action is taken. This method gives a much more accurate assessment of the state of the tree. Chris Neiland of EFDC has also said that he would not like trees to be felled without this survey. The Parish Council is further asking that after the survey a proper consultation should take place between The Corporation, The Verderers, the Tree Strategy Group and the general public as to the best way to proceed. The Parish Council is also considering the idea of planting of a new second Avenue of Oaks alongside but further in from existing rows to maintain the appearance for future generations. New Parking Restrictions in Theydon: The Parish Council is working with Essex County Council Highways Department to try to implement changes to parking restrictions in the village. The Parish Council is hopeful that by altering and adding restrictions to certain individual roads that the present level of commuter parking that has become excessive and a nuisance and danger to villagers can be reduced. Details of the proposed measures will be published in public notices, but these will not be sent to individual homes as has previously been the case. The roads proposed for One Hour waiting restrictions are Barn Mead, Dukes Avenue (part), Forest Drive, Orchard Drive, Morgan Crescent, Woodland way, Thrifts Mead, The Green and part of Avenue Road. Roads adjacent to these will have an alternate One Hour restriction. Other measures being considered include double yellow lines at the junctions of Loughton Lane and the Green (much needed on what has now become a dangerous junction because of parking on the bend Ed. ), Forest Drive and Dukes Avenue, and the Green, Poplar Row and Theydon Park Road. Councillors are hoping for a three hour, no-return waiting time in the lay-by near Phillip's butchers in Coppice Row and have requested three-hour no return parking in the bays along the avenue of trees. They also want a One Hour restriction in Station Approach next to the bottle banks. Councillors are hoping the review of these parking measures can be completed within three months. 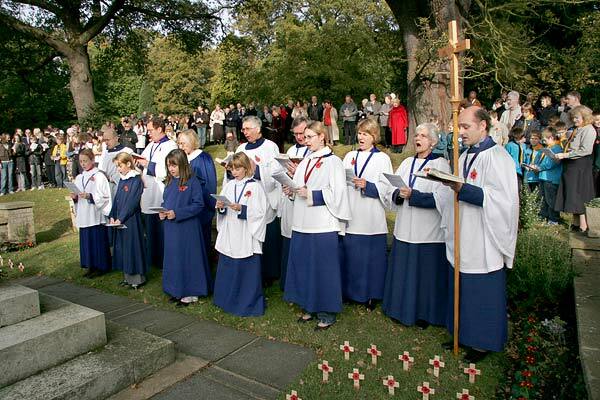 Our annual Service of Remembrance will take place on Sunday 12th November, 2006 at the Parish Church of St. Mary the Virgin, Coppice Row starting at the War Memorial at 10.45 a.m. and continuing in the Church for the main part of the service. In the event of inclement weather the entire service will take place in the Church. Medals may be worn and standards carried. 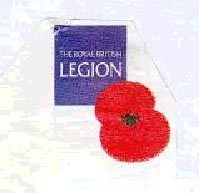 The Royal British Legion is a charity whose work is to help disabled service and ex- service personnel and their families. Please do give generously when you see the poppy sellers around or if they call on you at your home. 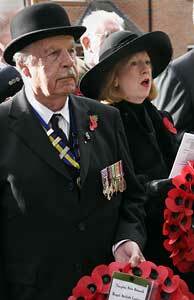 Armistice Day this year is Saturday 11th November at 11.00 a.m. Please pause for 2 minutes Just to Remember. 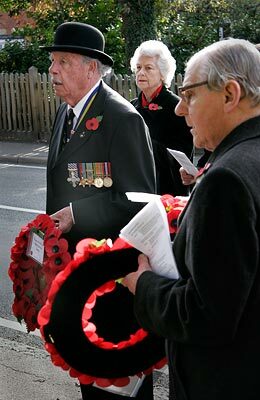 Wanted Poppy sellers for Theydon Bois. Can you please spare an hour or so to help either calling on houses or down by the shops. Please contact Alan Hollingbery at 31 Forest Drive. Tel: 01992 813260. May I once again take this opportunity to say ‘Thank you’ to all who have been involved with the poppy appeal over many years, the organisers and poppy sellers. You have done a grand job for the Royal British Legion. 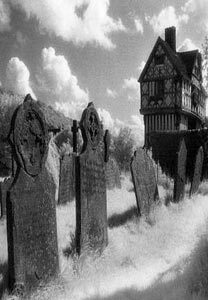 The Drama Society's next production will be ' Tiptoe Through the Tombstones' - a comedy thriller by Norman Robbins. Dates are Thurs 26th - Sat 28th October 2006, at Theydon Bois Village Hall. Sequel to 'A Tomb with a View' - a very funny thriller. The last remaining Tomb family members are gathered together at the old ancestral home to be informed of their inheritance, but this is no ordinary family! - things - and people - are not what they seem. Archangels opens in Loughton Lane: Archangels, Theydon's New Holistic Therapy Centre in Loughton Lane next to the Flower Yard is a Family Affair. Opened in August it is the brainchild of Aunt and Niece, Vicki Aiano and Louise Lazarus, Archangels offers a wide range of holistic therapies, including Reiki, Massage, Meditation and Reflexology, as well as stocking a wide range of books, candles, meditation tapes, crystals and gem stones for sale. Vicki and Louise, both highly qualified in their respective fields, will also be offering courses and workshops in many of the treatments available at the centre, to both individuals and groups.Vicki and Louise hope that the centre’s relaxed and friendly atmosphere will offer a place of calm away from the stresses of everyday life and they welcome people to come in and find out more about how holistic therapies can be of benefit to people of all ages. 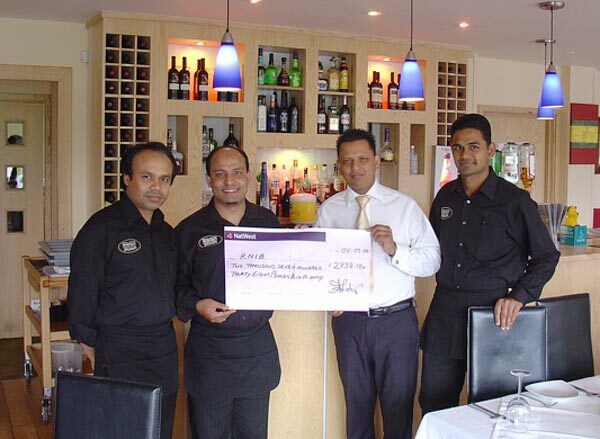 Thanks for the Support to RNIB: I would very much appreciate it if you could print a notice of thanks for the very successful charity night held at Indian Ocean restaurant Coppice Row on Tuesday 5th September 2006. The event in support of Royal National Institute of the Blind (RNIB) raised a staggering £2738.10. On behalf of RNIB I would like to thank the management and staff of the restaurant for its generosity which together with the support of several local shops who donated raffle prizes made the evening an over-whelming success. Blunts Farm: The other major planning appeal effecting our village is also progressing. Blunts Farm Estates are appealing the Enforcement Notice served on them by EFDC to prevent the further tipping of waste materials onto the site in connection with the Golf Course development. Although a final date has not yet been set for the Public Enquiry (it is likely to be early in the New Year) the Parish Council, Theydon Bois & Abridge Action Group (TBAAG), Theydon Bois & District Rural Preservation Society and many individuals have now submitted evidence to the Planning Inspectorate. Whatever happened to the East of England Plan? – You know, the one that proposed thousands of new houses, including 11,500 in the Epping Forest District. The good news for us is that the Panel Report to the Government, following the Examination in Public, recommends a reduction of 7,500 in the above figure (including the 6,000 proposed for North Weald) and that the remainder should be part of the urban extensions of Harlow. In reviewing the Green Belt to accommodate these urban extensions, it says that the new boundaries should “specifically maintain the integrity of the principles of the Gibberd Plan and landscape setting of Harlow and the physical and visual separation of the town from smaller settlements to the west”. Let’s hope Government minister Ruth Kelly agrees. However, the Society is affiliated to the Campaign to Protect Rural England (CPRE) that says the Government is about to make a big decision on how the East of England will develop. 505,500 new homes and accompanying roads and industrial development are planned for the East of England. The effects on the countryside and the quality of life could be devastating. CPRE is encouraging as many people as possible to fill out one of its campaigning postcards so that the Government knows what people think about the proposed plans. To request your postcards, contact CPRE’s Campaigns Team on 020 7981 2869, or email campaigns@cpre.org.uk.